Finally, your dreams of fighting Doctor Doom and Magneto are about to come true... well, kind of; Marvel has announced plans for an MMO based on its kids' line, Super Hero Squad. Although no release date has been announced yet, Newsarama.com writes that Marvel's partner in the MMO, Gazillion Entertainment, have been quietly staffing up for this project for more than a year - although as recently as yesterday interested parties could still find jobs available on Twitter, of all places. 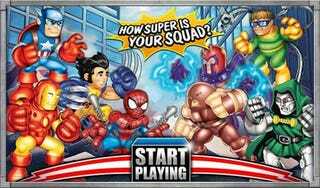 This is Marvel's second attempt at an MMO after its failed Microsoft partnership that died last year, and yet another example of how strongly Marvel feels about its Super Hero Squad line, which already has a toyline, comic strip and upcoming cartoon series to its name. Fans of Marvel's regular superheroes, and not their more-kid-friendly counterparts, shouldn't worry too much, however. Marvel and Gazillion also plan to release Marvel Universe, based upon the classic versions of the characters, at some unspecified point in the future. Given that Sony has been working on a DC Comics MMO for years, it may be time for the rivalry between the two publishers to move to the online game space, and see which project can take the longest to get to market.